By historical standards, the early years of the twenty-first century have been remarkably peaceful. Only rarely are people killed by their own kind, and only very, very rarely are they killed by other animals, microorganisms excepted. Nevertheless, even though the statistics should reassure, many people worry about lone killers, murderous gangs, and terrorist bands. At the same time, most people are vaguely aware that even in this relatively calm era, wars have made countless victims. Yet mass violence against unarmed civilians has claimed three to four times as many lives in the past century as war: one hundred million at least, and possibly many more. These large-scale killings have required the efforts of hundreds of thousands of perpetrators. Such men (and almost all were males) were ready to kill, indiscriminately, for many hours a day, for days and weeks at a stretch, and sometimes for months or even years. Unlike common criminals who work outside the mainstream of society, in secret, on their own or with a few accomplices, mass murderers almost always worked in large teams, with full knowledge of the authorities and on their orders. Without exception, they operated within a supportive social context, most often firmly embedded in the institutions of the ruling regime. Unlike terrorists, the mass murderers usually did not want their deeds to be widely known. How people are enrolled in the service of evil is a question that lies at the heart of this trenchant book. The subject here is mass annihilation—that is, massive, asymmetric violence at close range, where killers and victims are in direct confrontation. 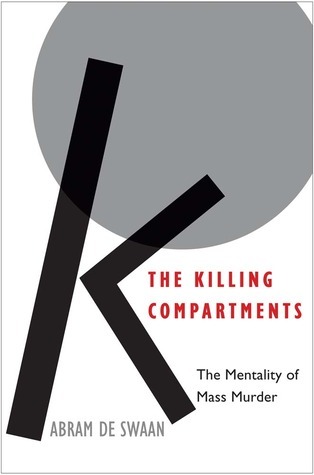 Abram de Swaan offers a taxonomy of mass violence that focuses on the rank-and-file perpetrators, examining how murderous regimes recruit them and create what De Swaan calls the “killing compartments” that make possible the worst abominations without apparent moral misgiving, without a sense of personal responsibility, and, above all, without pity. De Swaan wonders where extreme violence comes from and where it goes—seemingly without a trace—when the wild and barbaric gore is over. And what about the perpetrators themselves? Are they merely and only the product of external circumstance? Or is there something in their makeup that helps them become mass murderers? Drawing on a wide range of disciplines, including sociology, anthropology, political science, history, and psychology, De Swaan sheds light on an urgent and seemingly intractable pathology that continues to poison peoples all over the world.